The medieval city wall. Today, two of the twelve original gates are still standing, the Priory gate and the Tower gate. Sections of the city wall itself also survive, with the best-preserved section located within Lady Herbert’s Garden, which is also open to the public. The old cathedral ruins. German bombs destroyed the original cathedral; however, these are some of the most picturesque ruins you’ll see, and include the original stained-glass windows that have remained intact, and the famous “Charred Cross”. Coventry Canal Basin. Restored from the original 19th century wharf, this remains a popular tourist attraction, complimented by city centre shops and the impressive canal-side ‘art trail’. Shopping centres. A visit to Coventry would be incomplete without a trip to one of the big shopping centres in the city; take your choice from West Orchards, Cathedral Lanes and Lower Precinct, all housing the biggest retailers with the best deals. Alternatively, try visiting the independent stores found in the City Arcade and on Hertford Street; here you’ll find fresh and exotic foods amongst other things. Millennium Place. Visit here and you’ll witness many public works of art, by international artists and designers. St Mary’s Guildhall. Take a trip to this historic building in which Mary, Queen of Scots was once imprisoned. The Lounge. One of the city’s most popular eateries, where you can enjoy fine food in a relaxed atmosphere with music playing. Café Inca. A non-smoking café with outdoor seating. Lunchtime snacks are the order of the day. Mr Porky’s. As you’ve probably guessed from the name, pork is the focus of the food offered here, from pork-based meals to snacks like hotdogs. 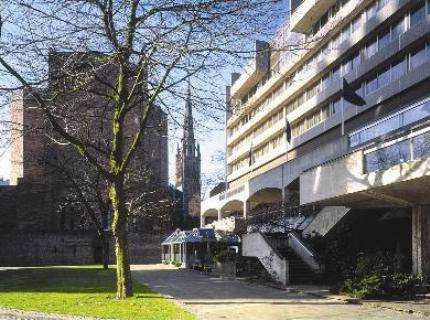 Coventry boasts a wide variety of different types of accommodation for the visitor. There are plenty of top-quality historic hotels and guesthouses in the region, located in diverse settings. These range from hotels in the city centre district – for those looking for an easy walking distance to the city’s attractions – to hotels in the surrounding villages and towns, which provide the ideal base from which to explore the local countryside. Such hotels supply all kinds of rooms at affordable prices. Additionally, dining facilities range from standard bed-and-breakfast rates to room only deals, and further options in which a full dinner is also included. For visitors looking for less traditional accommodation, there are lots of other options including inns, self-catering, caravans and campsites, hostels and more. If you’re looking to be entertained, then Coventry is the place to come, offering numerous venues with a wide range of things to do. The Odeon and Showcase Cinemas offer multiple screens showing all the latest Hollywood films, which can be enjoyed through state-of-the-art technology. Those with a taste for the arts will be spoilt for choice as Coventry is home to many theaters, from the amateur-owned Criterion Theatre to The Butts Theatre, which comes complete with a 1930s-style interior. Alternatively, visitors looking to sample Coventry’s nightlife will discover a number of nightclubs, including Dogma, Bonds and Ikons, that play all kinds of music through the early hours. Sporty visitors can try out Coventry’s golf clubs or make a booking at Planet Ice Arena; there’s also bowling on offer at Coventry Megabowl. Coventry is the ideal choice if you’re looking to visit a city that offers something for everyone. By day, you can go out shopping and sample the food at a variety of cafés and restaurants, and later on you can try out Coventry’s exciting nightlife. Alternatively, if you’re more laid-back, you can visit some or all of Coventry’s historic tourist attractions, or investigate the city’s culture spots. One thing is certain – you’ll never be short of things to do when you take a trip to Coventry.